A suburban mother living with Type 1 Diabetes said she is being denied a potentially life-saving medical device by her insurance provider. Amy Carbone of Palos Heights said she also has hypoglycemia unawareness, a complication of diabetes in which the patient is unaware of a deep drop in blood sugar levels. She said her condition makes her more susceptible to losing consciousness. "Without knowing when my blood sugar gets low I could lose consciousness and I could die," Carbone said. Carbone’s nine-year-old son, Matthew, recently found his mother lying unconscious in her bedroom. "I could hear him saying, 'Mommy, Mommy.’ But I couldn’t move. I couldn’t react. I couldn’t do anything," Carbone said. Carbone recovered but she said she is concerned about future bouts of unconsciousness. She currently wears an insulin pump to manage her diabetes, but due to her hypoglycemia unawareness, her medical team is urging her to keep her blood sugar levels high. Unfortunately, high blood sugar levels can result in additional health problems, including blindness and kidney failure. That’s why Carbone’s nurse practitioner prescribed her a new device called the Medtronic MiniMed 530G with Enlite. It includes an insulin pump and a continuous glucose monitoring system. The device shuts off when blood sugar gets low. "I’ve got other patients who are on this device who said it’s a God-send because without it they would have no idea that their sugars were dropping," said Terese Bertucci, APN. Medical professionals call the device state-of-the-art and the future of diabetes management. "The combination of continuous glucose monitoring plus the pump could potentially be life-saving and even cost-saving," said Dr. Louis Philipson of the University of Chicago’s Kovler Diabetes Center. Carbone’s insurance provider, United HealthCare, will not cover the device for her. The company sent a denial letter to Carbone which read the services "are not eligible for coverage because your plan does not cover unproven procedures." The letter also stated "current medical studies have not shown that this device is equal to or better than other standard pumps" for Carbone’s condition. "I have worked really hard to keep myself healthy and I really resent the fact that they are trying to undo all that I’ve done," Carbone said. 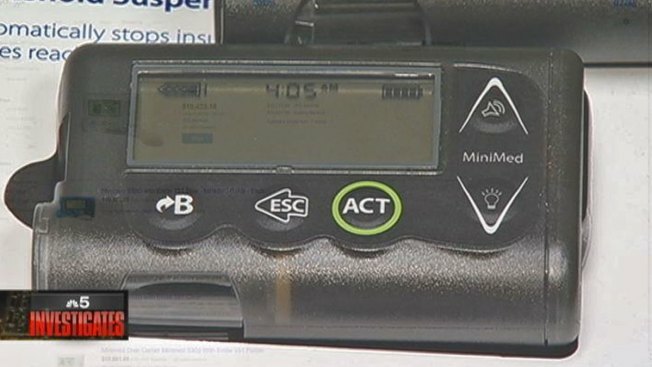 United HealthCare would not comment on whether it’s approved the device for its members but they responded by saying there are many insulin pump that the plan covers. "We would be happy to work with Ms. Carbone and her physician to find an insulin pump that meets her needs and is covered under her benefit plan," United HealthCare spokesperson Tony Marusic wrote in a statement to NBC 5 Investigates. The FDA-approved MiniMed 530G with Enlite is listed online at a cost of more than $10,000. The device also requires constant supplies. But other insurance companies, including Aetna, Cigna, Humana and Blue Cross/Blue Shield, told NBC 5 Investigates they would cover the device for members who meet their criteria. Medicare said it does not cover the device or any other devices that perform continuous glucose monitoring. Philipson said there are an estimated 2.8 million people in the United States living with Type 1 Diabetes. He said the MiniMed device checks a patient’s glucose levels about 288 times a day and could alert the patient before his or her blood sugar drops. "I think it’s very acceptable technology," Philipson said. "It’s FDA-approved, it’s certainly not an experiment." Philipson is supporting an effort in the Illinois legislature that would require increased insurance coverage of diabetes test strips used to monitor blood sugar levels. "To prevent low or high blood sugar over the course of a lifetime more than repays whatever few pennies a day we’re talking about," Philipson said.